Movie Review – Won’t You Be My Neighbor? Mr. Rogers was a part of the childhood of so many, and none of us will ever forget the impact he had on our lives. He’s as important as Sesame Street, as legendary as Santa Claus, and as historic as television itself. For countless kids, he was television, he was the reason you watched, and he was a trusted voice when not every sound in your world made sense. I remember watching his show with joy; the puppets, the trolley, the cardigans, the shoes, the traffic light, the fish, the small adventures around town. It was like having a wonderful relative that cared about you and wanted to show you the best that life had to offer, and yet this man had the capacity to wear that role for millions, which only shows the depth of his compassion and his determination. The ability to love and to show love is the most important quality we can possess, and Mr. Rogers taught many of us where that quality could be found, because he wasn’t afraid to show it within himself. Fred Rogers was set to be a minister when he first encountered the radical new invention called television, and it changed his life forever. He understood that television was a way to get a message across that had never been and would never be rivaled. He could spread his version of God’s love through a new technology, and that version was based on caring for others above all else. He wanted to show the world that kindness could make a difference, that friendship could be forever, that a neighborhood can be made up of whoever is willing to lend a helping hand to another, that love really is all we need. 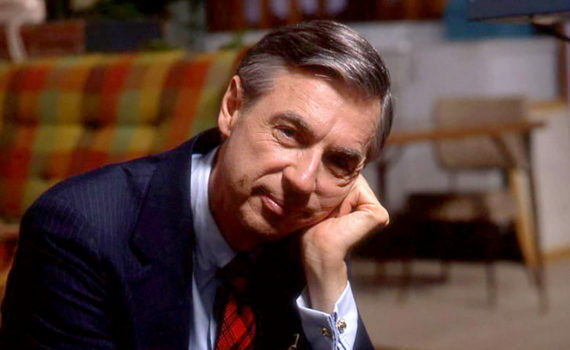 From meager beginnings to superstardom, Mr. Rodgers would become a television persona that mirrored the man, lending credibility to a message of peace and understanding that wasn’t exactly in holding with any religion or belief, but was somehow independently and marvelously magical. I watched my fair share of Mr. Rodgers when I was younger, and I always loved the ease with which you could turn it on. There weren’t action scenes, you didn’t need to follow every episode, nothing spectacular was going to pop out of the screen, you could just simply watch and enjoy, as this wonderful man showed you around his neighborhood and around your own imagination. But he broached serious topics too, and Fred Rogers wasn’t afraid to take chances or push the envelope; quite the rebel for a buttoned-down minister in the 60s and 70s. This documentary takes us along for the ride with Fred and his family, as he attempts to remake TV in his image, not conforming but forming, giving kids something they had always secretly wanted. His message was simple; you’re welcome here, you’re loved the way you are here, you’re worth something here, and no one is excluded. Pretty simple and very brilliant, and he created a show based on this concept, which seems idealistic, but somehow worked. This film captures that spirit marvelously, and is worth your emotional investment.